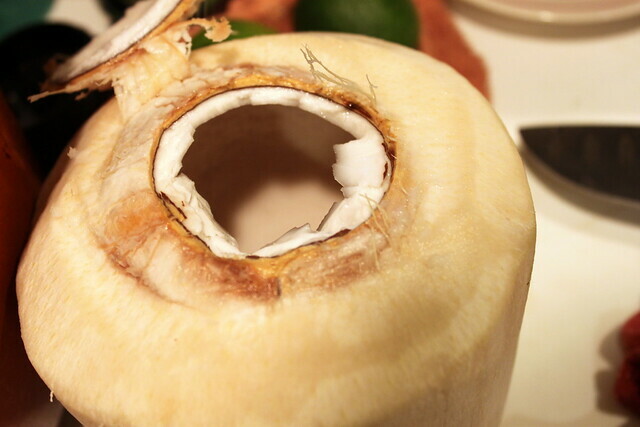 A couple of weeks ago, while at a friend’s house, I saw a brown coconut sitting in their fruit bowl and I had to ask, “Is that coconut you have there decorative or do you actually eat it? ?” Because I’ve only ever bought coconuts to make coconut huts for my betta fish. But I threw out the meat on the inside. 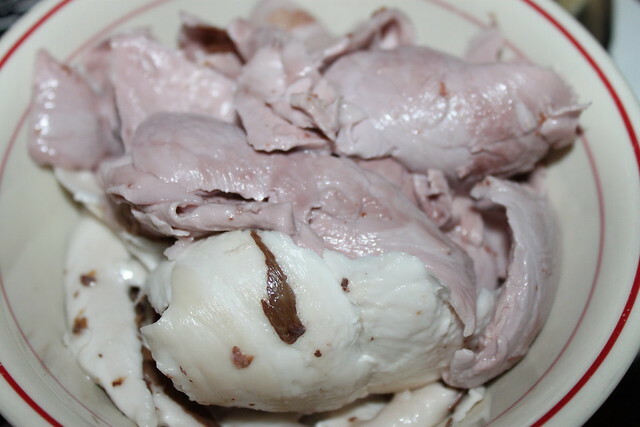 They showed me a bowl of coconut meat from a brown coconut in their fridge and let me try some. It was pretty good. Crunchy. 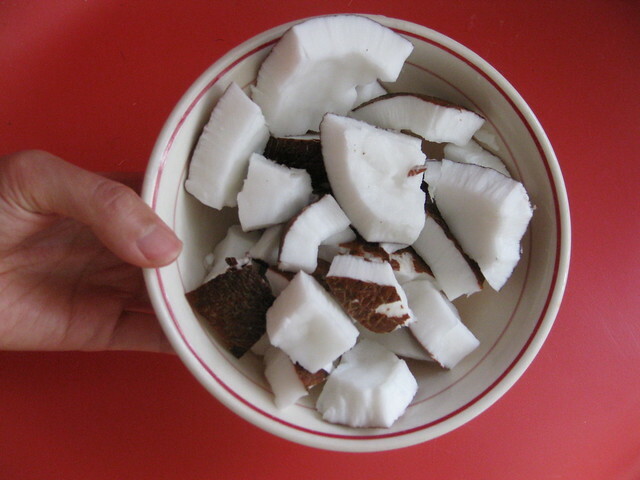 Coconutty. 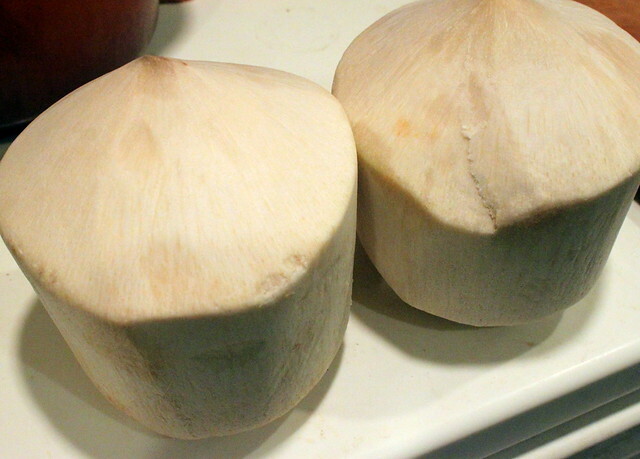 Then they told me about the young coconuts at Asian markets too, so I got curious and decided to get some for myself. We got 2 young coconuts and 1 brown one. These 2 young ones were filled with cool, mildly sweet water. Pretty refreshing. We watched some videos on YouTube to learn how to open them. I was glad I have a cheap santoku knife. I took a hammer to it to help open the top. After drinking the water, you can grab a spoon and scoop out the jelly flesh. It’s like a sweet creamy dessert. The brown coconut we just cracked in half with the claw end of a hammer and then I used a knife to pry out the meat. We went back for 3 more fresh coconuts and another brown coconut the following week. It’s my new favorite treat! Perfect for this hot weather. After weeks on a row boat across the Pacific Ocean, and then some more weeks on a donkey’s back across the continental U.S., my fountain pens finally, FINALLY arrived 2 months after I ordered them. I’ve used them for a month now so I have a good enough idea of how they write to opine about them. I got the Pilot Petit1, fine nib. It’s the blue mini pen on the bottom of the picture. Without posting the cap on the back, it’s too short for my hand. Overall, it’s only okay. It writes pretty wet, which for cheapo work notebooks isn’t great, but I’ll still use it for work because it’s pretty and I want to use non-disposable pens at work, but not anything I’d be sad to lose. I love that it’s a see-through pen so I can always tell when the ink is running low. I brought ink and refilling supplies to refill the cartridge at work. This way I don’t need to worry about running out of ink. This isn’t a pen I would recommend. The the inkflow is too much so the fine nib writes like a medium nib. And the Pilot Kakuno. This is supposed to be a kiddie beginner fountain pen. As if fountain pens needed levels. I mean, if you can use a crayon, you can use a fountain pen. Anyway, this is a great inexpensive pen. I got the fine nib and it writes like a freshly sharpened pencil. There’s no bleed through to the other side of the paper, even on regular paper, so I can use it for journaling on my fountain-pen unfriendly Miquelrius notebook. And still use both sides of the paper! It’s very comfortable to hold and write with and I found myself grabbing it frequently for making shopping lists, journaling, sticking it into my bag on my way out in case I need to make notes for myself. It’s handy dandy! I would DEFINITELY recommend this. It’s actually my second favorite pen after the Pelikan. So now there are 5 pens in my collection. Pelikan m 205 F – The Pelikan seems to just get better with use. It’s a piston-fill and I love that about it. It’s the only pen I can refill directly in the ink bottle. 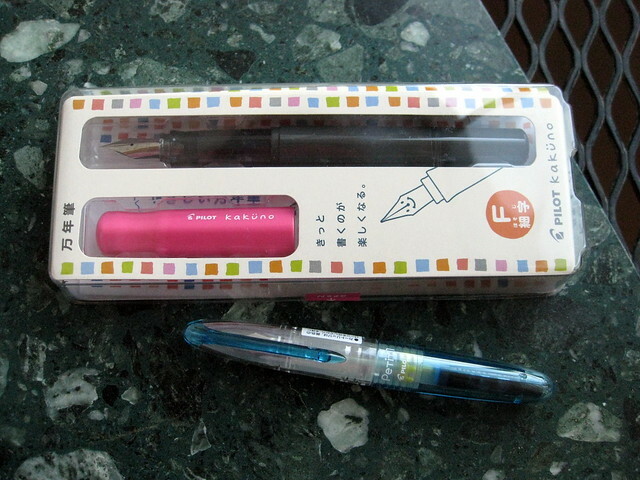 Pilot Kakuno F – This one is great on cheap paper. It feels like I’m using a pencil, which I enjoy. It writes consistently. Pilot Metropolitan M – I like the Metropolitan a lot because it feels substantial. And on good paper, the medium nib really shows off the ink beautifully. Pilot Petit 1 F – Easy carry, inexpensive, reliable pen. Pilot 78G Broad – The one I have has an issue where the pen nib portion seems to keep unscrewing from the pen body as I write. I’m constantly having to rescrew it back in as I write. The broad nib can be a little skippy/scratchy at times too. Still, it’s my only broad nib pen and that makes it great with showing off colors and looking dramatic. If my handwriting were better, I’d probably appreciate this a lot more. Summer isn’t quite here yet but it’s getting close. In fact, it was so hot outside yesterday I nearly passed out playing tennis. It didn’t help that I was playing at 1PM, which is close to peak sun. I couldn’t drink enough water to keep me cool and hydrated, the sun was baking so hot. I had to cut the playing short to cool down.